Petersham, Massachusetts: Lone Oak Press, 2005. Esser, Mark. Oblong quarto. 89pp. 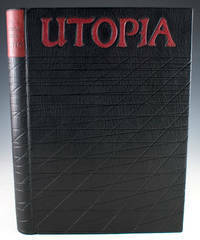 From an edition of fourteen deluxe copies and 70 standard copies, this is one of five deluxe copies chosen to be specially bound for the international traveling exhibit "InsideOUT: Contemporary Bindings of Private Press Books," and as such, it does not include the extra suite or block as listed on the colophon. The exhibit, organized by British binding society Designer Bookbinders, married the works of nine private presses with the artistry of 59 binders from the United Kingdom and the United States. The text consists of selections from Henry David Thoreau's journal, which describe the vernal pools of New England that serve as breeding habitats for all manner of amphibians. Accompanying the text are twenty-eight engravings by Lone Oak Press founder Abigail Rorer, some of which are hand-colored by the artist. The detailed drawings brilliantly capture the teeming life and varied textures of these small pools. The book was designed by Michael Russem of the Kat Ran Press and includes an introduction by Thoreau scholar Bradley P. Dean. 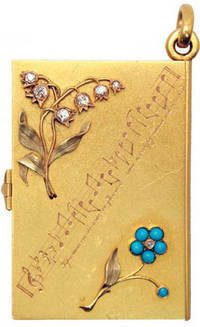 The designer binding, specially commissioned for the exhibit, is by Mark Esser. The boards are covered in full brown goatskin with leather onlays and gold and blind tooling that depict green reeds entering a rippling pool. The reeds are cleverly refracted as they pierce the water's surface. A repeating yellow leaf design frames the image, continuing inside onto the green goatskin doublures. Opposite, the marbled paper flyleaves are reminiscent of stones and pebbles. Housed in a brown cloth clamshell box. As a whole, Esser's work evokes the deep peace found in nature and the surprises that lurk just below the surface. Esser developed the curriculum and was the first instructor for the hand bookbinding program at the North Bennet Street School in Boston, and now works as a private binder in Massachusetts. T.e.g. Extremely fine.